Emojis are fine if you stick to smiley face and the other simple ones. Outside of that you’re risking sending something to someone that’s easily misinterpreted. Add to that the fact that emoji designs differ across devices and you’re entering a minefield of uncertainty that can lead to loads of issues. Take a look at our lead image. It shows the Angry emoji from three different devices. What this means is that the emoji you send isn’t necessarily the same as the one that’s received if you’re sending across different platforms. 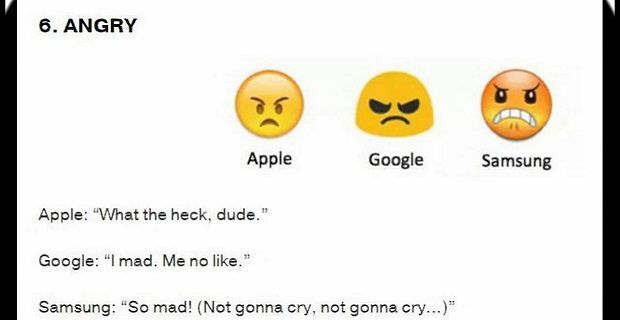 In our image, Apple, Google and Samsung show different images for Angry but you’ll also get different emojis when using applications like Facebook and Twitter. A study by GroupLens concluded the each emoji is different because our emotional responses to them are different so when you send from a iOS device to an Android device or a Windows phone, you’re potentially sending something that doesn’t have the desired effect. The study’s results put the emojis on a scale of -5 to +5. Their results for the happy face emoji were surprising as the iPhone emoji, which shows a strained smile, was rated as -1 whereas the smiley face on rivals phones from LG, Samsung, Google and Microsoft registered +4 or +5. A quick review of the image here suggests very much the same thing as GroupLens’ study when you consider the effect of the Angry face emoji. The Apple image just doesn’t represent the feeling well enough, whereas the one from Samsung really gets to the point. The Google one is a good mixture of the pair, but we prefer the Samsung image as the point of an Emoji is to get your feelings across with a simple image. If you have to explain it with words, it hasn’t done its job.